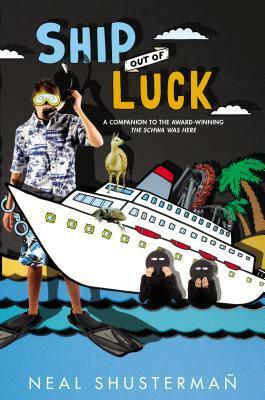 Having not read any of the previous books, I wasn’t sure what quite to expect with Ship Out of Luck. I decided to plunge into the book and think of it as a standalone, which worked well. Antsy struck me as a great character right off the bat. He obviously had a lot of history with getting in trouble and it was easy to see how things could get out of hand on a 7 day cruise for Old Man Crawley’s 80th birthday. I loved the variety of characters. Lexie is a blind, rich girl – the granddaughter of Crawley and has her own unique problems during the cruise. Howie is a friend of Antsy who is invited along because Antsy’s brother cannot make the cruise. In order to get Howie on the ship, Antsy creatively makes him a fake birth certificate, since Howie has neither that or a passport for some weird reason. Then there’s Tilde, a stowaway aboard the cruise who is set on seeking Antsy’s help and attention. Having the attention of a beautiful girl, Antsy cannot seem to resist helping, even with his elaborate way of trying to avoid her. The only question is what is Tilde’s end game and why involve Antsy in the first place? I loved the banter between Antsy and Crawley the most, who have a repertoire that will keep you laughing throughout the book. In the end, you realize how much of an idiot, but overall great guy Antsy is, even if he doesn’t seem to think so. I will definitely have to read the other books now to get more about these wonderful characters. Final Verdict: A hilarious novel that stands on its own but features an ongoing set of characters you will want to read more about. This one is swinging a little more into YA or upper MG with relationship situations occurring throughout the book. Your Comment Here…Does sound like a fun book, but I womder if it would be a better read if I read the other two before this one. I am captivated with your wonderful review of this unique and entertaining book. The characters all sound fascinating and the story very special. I think my children would enjoy the mix of characters in the book. Not to mention…I think I would also. Did not read first book in series. Will have to add it to my library list.